Here's how I shoot nowadays. 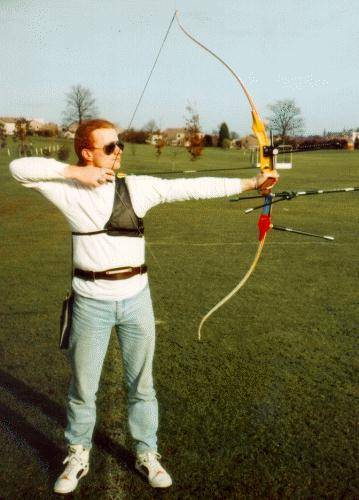 This photo was taken at the Northern Area double Fita Star in 1995, when I broke three Scottish records. 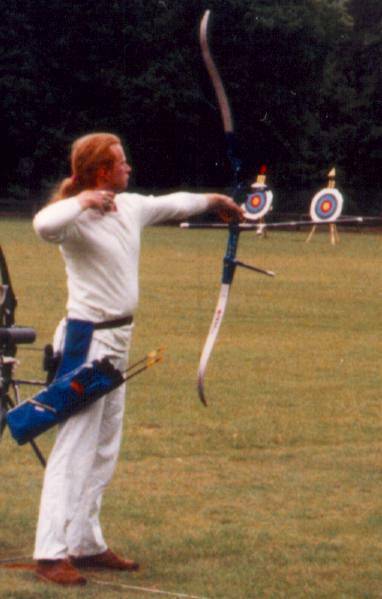 It's a pity that the original photo wasn't a bit larger, you can't see much detail, but the bottom rod and flat V-bar setup are clearly visible, as is the archer's belly :-( This photo is Copyright (C) J. Smith, 1995. 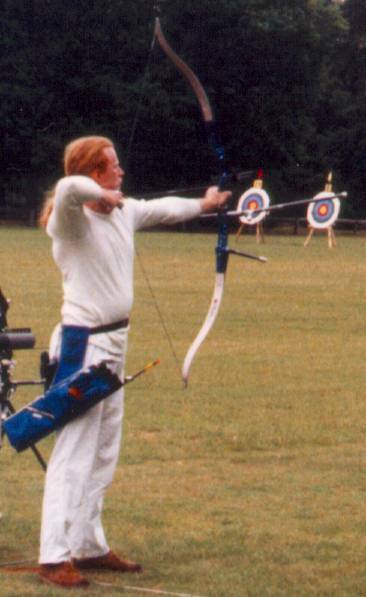 The next shot shows the follow-through, which should be relaxed, with the bow reacting forwards. This photo is Copyright (C) J. Smith, 1995. This is an old photo showing how I used to shoot, with a side anchor and two-finger loose. It also shows my old bow, a Marksman Portland 2000, which was re-painted many times (it was originally a rather horrible brown colour). I've also changed the V-bar, twin rods, arrow rest, quiver, tab, fletching colour, and I don't use a chest guard anymore.